Perhaps the most dangerous part of holding dual citizenship is forgetting which country you’re in when you ask where the bathroom is in a new restaurant. Embarrassing. Okay, we’re just kidding a little bit there. For the most part, dual citizenship has only a few drawbacks and mostly under very specific circumstances. One general area of concern is that one (or both) of the countries might decide that you are, in fact, a citizen of their country and impose unpleasant restrictions on you. In particular, you should consider the fact that most countries around the world do NOT recognize the part of the U.S. naturalization service that renounces your previous citizenship as official. This means you might still get drafted for military service in your previous country or not allowed to leave if you go back for a visit. Canada is a good example of this. The solution is to talk to officials in both countries before crossing that border. 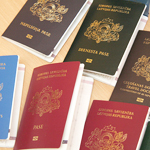 There are two specific instances that dual citizenship could cause you a basketful of trouble. The first would be if your job requires a security clearance for access to classified US government information. Holding a second citizenship could easily get higher clearances denied or current clearances revoked. The second problem area arises if you decide to throw your hat into the political arena, especially at the federal level. You can seriously expect that your opponent (s) will bring up your dual citizenship alongside questions about your patriotism and loyalty. So if you want to get that second citizenship, think hard.